Zootopia (2016) – Movie Review – Another Movie Blog! The Disney Revival that began with John Lasseter and The Princess and The Frog has largely worked not because it radically reinvents the formula of its films, but because it subverts the already popular Disney tropes in a way that makes them feel contemporary. It looked at the competition, particularly Lasseter’s own Pixar and the then dominating Dreamworks Studios, saw what worked for each and incorporated they made them feel more knowing, but also more rich in storytelling. 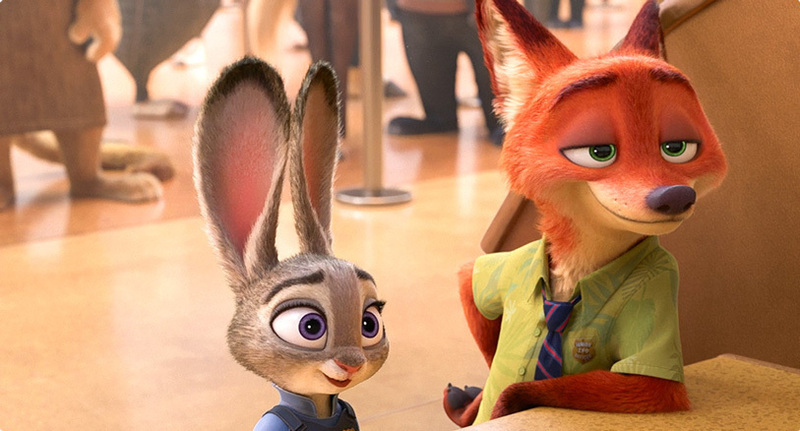 Zootopia (or Zootropolis in the UK) is the most “Dreamworks” film Disney has made since Wreck it Ralph. At heart this is a buddy cop movie, full of quips and funny characters that make it the funniest Disney movie since The Emperor’s New Groove. But what keeps it being as smart aleck as many of those films (like Shark’s Tale), other than having stronger joke, is that at its core it blends that together with characters who are absolutely sincere in intent. Judy Hopp is a welcome change in a female Disney lead, focused on career and greater good rather than any specific destiny (Also adorable. Children will probably love her). Ginnifer Goodwin and Jason Bateman have amazing chemistry as Judy and Nick together, with the latter providing the clever and witty counterpoint to Judy’s rigid sincerity. Even if you know the beats of this relationship as it goes, this also helps to serve the surprisingly emotionally intelligent story arc. Many people have read into the racial subtexts of Zootopia. But this isn’t a straight allegory like Animal Farm. Actually the movie’s cleverest move is that it doesn’t assign a specific race to a specific animal; it intentionally puts discrimination jokes to many different animal breeds, and the predator/prey dichotomy is one that can be universally applied and easily understood. But really the movie’s main focuses are about following your dreams, being who you are, working together as a team, all the typical Disney messages. Its just at the end the way it comes to those conclusions is smarter than normal. Of course, because this was the product of four writers, if you try and read too much into the movie it kind of falls apart. The “biology” aspects of the film are not as interesting as the “propaganda” and its ramifications (I’m probably asking too much there though), which in turn lets the villains in the movie feel a little undercooked. Occasionally the sentimental Disney elements feel superfluous, particularly in an unnecessary flashback sequence (the only time the movie felt needlessly manipulative). It also teeters perilously close to those scenes in films like Shark Tale that are only there to humour the adults, like Breaking Bad references and a Godfather joke in 2016 (fortunately the jokes are actually funny, but they might as well have been pandering to me). Also, not every movie has to have a song Disney! But if nothing else Zootopia is a place to get lost in. Interconnecting systems, different sizes of cities, ghettos and different patterns of living that come with them. The world of this movie is thought out more than the vast majority of animated films. But the characters and situations are funny and entertaining enough that you don’t end up just looking at the buildings.